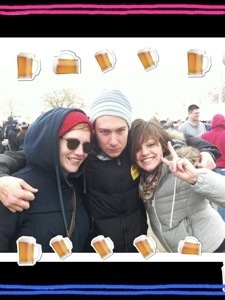 We had a lot of fun trying all of the different beers, and just being together. My favorite beer? A Kombucha Ginger beer from Unity Vibration in Ypsilanti, Michigan. Kombucha beer is not something I think I would ordinarily try, but 1) a beer festival is a place to expand your horizons, and 2) after several other samples I was feeling adventurous. Several samples and unintentionally stolen sandwiches later, we were still standing. Our evening consisted of playing Cards Against Humanity, lots of laughter, and too much amazing food prepared by our friends (one of whom is the fellow pretending to be angry in the picture above). I’ve been told there will be a Winter Beer Festival in Grand Rapids, so I’m excited to potentially try more interesting flavors. 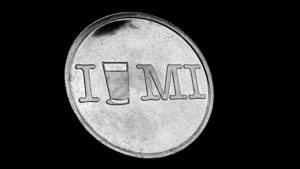 I tend to be an IPA girl myself–what kind of beer do you like? 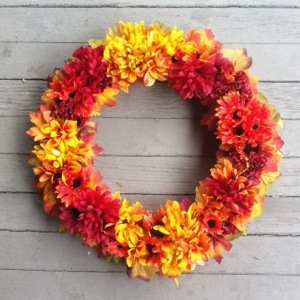 I’ve been thinking about ways to make our new house a home, and I thought one good way to do it would be to have a nice Autumn wreath. I was pretty surprised to see how expensive seasonal wreaths are at most stores, and how making your own can end up being a pricey endeavor, too. Luckily, I found a few ways to cut the price down and still end up with beautiful results, all the while enjoying myself as I put it together. Firstly, I used a 50% off coupon at Hobby Lobby for the wreath form. Hobby Lobby has an app that will always give you a coupon code to use for a discount. I got lucky and managed to hit Hobby Lobby when they were having a 50% off all ribbons sale, too, so I went ahead and bought a color I thought went well with my Autumn theme. I was shocked to see that at most craft stores a single bunch of artificial flowers will often cost $5.00 or more, so I ended up purchasing my bunches from the dollar store, cutting down on the overall cost of the project dramatically. The first step was laying out the flowers in clusters I thought looked nice. After wrapping the ribbon around the wreath form, it was time to add flowers. 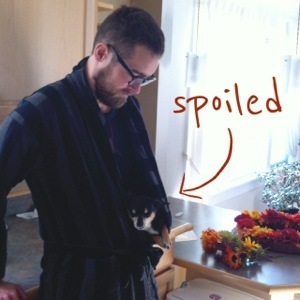 I think he knows he’s spoiled! 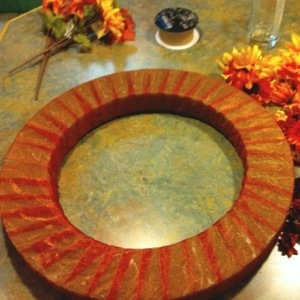 After adding the leaves and ensuring there were no strands of hot glue residue, I was finished with my wreath. I think it turned out really well, and am happy to cross the project off my Autumn Bucket List. You’d never guess that the entire project cost less than $20.00! 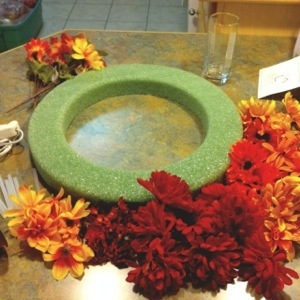 Have you ever tried making a wreath? Do you have any tips? 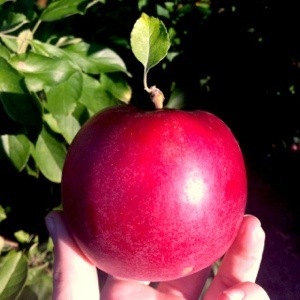 In preparation for the future Monte Cristos in my life, I got straight to making Apple Butter. I found a really simple Slow Cooker recipe and adapted it slightly for a very delicious, healthy yield. 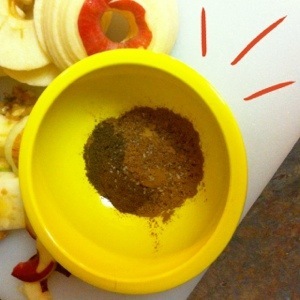 Then you mix up your spices, which are pretty typical spices for apple-based dishes: cinnamon, nutmeg, allspice, ground cloves, and salt. Time to mix everything together in your crock pot before adding 1/4 cup of unrefined sweetener, such as honey or palm sugar. I chose to use Agave, and though the bottle said Agave tends to be sweeter than most sweetening options, I still used a 1/4 of a cup and ended up with just a hint of sweetness. 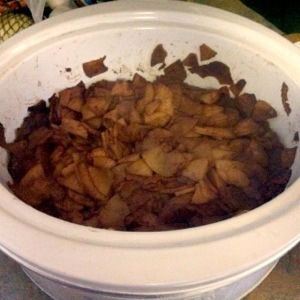 I also added about a teaspoon of vanilla, and then set the slow cooker on low for about 9 hours. 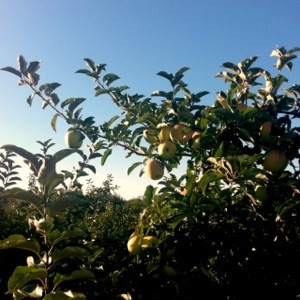 When I woke up in the morning and saw the above, I was worried that somehow the apples didn’t cook down enough, but after whisking the apple mixture with my blender, it immediately transformed into a lovely texture. 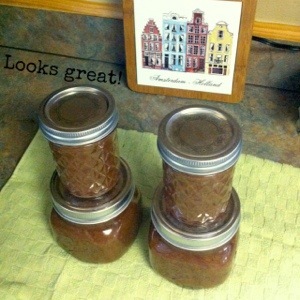 The recipe made a little over four 1/2 pint jars, and tasted delicious! 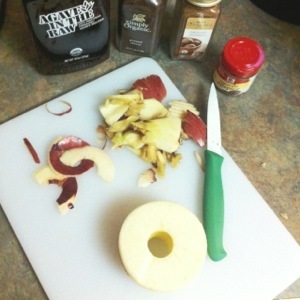 12 medium apples (4 each of Granny Smith, Gala, Honeycrisp) peeled, cored, cut into 1″ cubes. 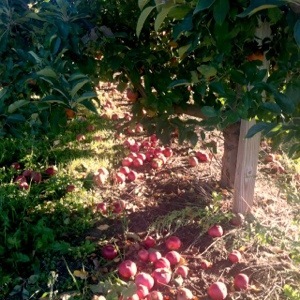 *The recipe suggests mixing the apples with tart Granny Smith & sweet apples like Gala & Honeycrisp, or other sweet apples like Golden Delicious, Pink Lady, Red Delicious, Fuji, Ambrosia and Spartan. I used Jonagold, Jonathan and Northern Spy because I read that those apples are good for both Apple Butter and for pies). 1/4 cup unrefined sweetener, more or less to taste (sucanat or coconut palm sugar or honey) *I used Agave. Combine dry ingredients in a small bowl. 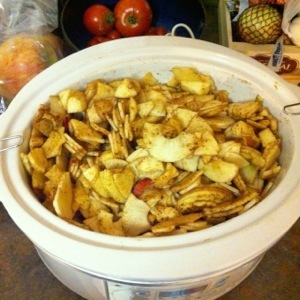 Add apples to the slow-cooker, pour dry ingredients over and toss to coat. Also, pour in sweetener and vanilla and stir, if using. Cover, cook on low 8 – 10 hours until tender and brown. If you prefer chunky apple butter, leave as is. For a creamier, less chunky, butter, whisk until smooth. Allow to cool to room temperature, and add to 1/2 pint or pint jelly jars, leaving about 1″ head space at the top to allow for expanding. Cover with lid and freeze or refrigerate. 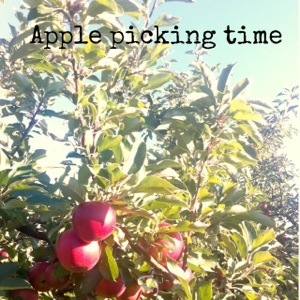 I enjoyed crossing off Apple Picking and making Apple Butter from my Autumn Bucket List. Have you done any fun fall things yet this year? What a crazy couple of weeks we’ve been having! Remember when I mentioned there might be some big changes this month? 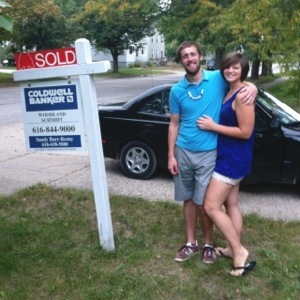 Well, last Friday we closed on a house! That’s a change for sure!! 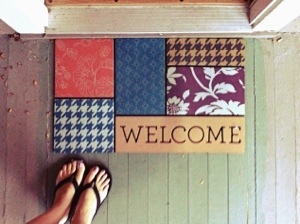 We are so excited to make our first house a home, though it’s been a lot of work already. We had only three days to move from an apartment over to our new home, so we were pretty busy! 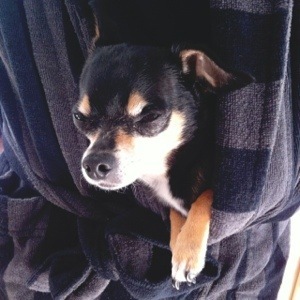 I went from work to moving all weekend, and last week every day off I had (and pretty much every spare moment!) was spent unpacking boxes and sorting things. 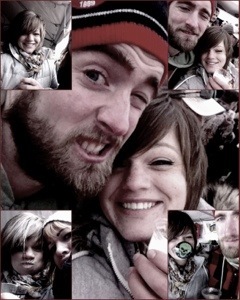 It has felt kind of overwhelming, but at the same time we’re having a lot of fun. Opening all of our lovely gifts from when we got married (we never used anything before leaving for Japan) was super nice–we felt so thankful all over again. We are so lucky to have a new home with so many wonderful things ready for us to use for the first time (like my kitchen aid! Weeeeeeeeeee!). After closing Friday, Chad and I sat on our dining room floor, looking around at our pretty house. 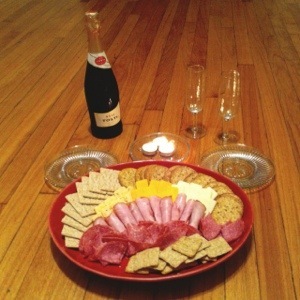 Chad’s mom prepared champagne and a lovely cracker, cheese and meat platter as a house warming gift, so we dug in happily together, ready to start the next journey in our lives. 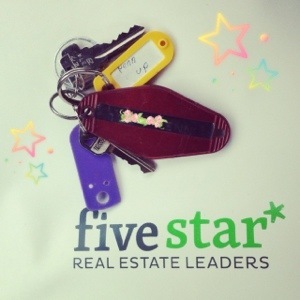 I’m looking forward to posting lots of updates as we get settled in! Over the weekend I had a very full Saturday! 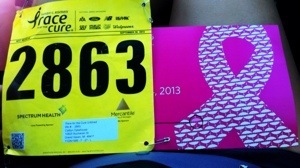 The day started with waking up around 6 and heading with Chad to Grandville for the Race for the Cure. 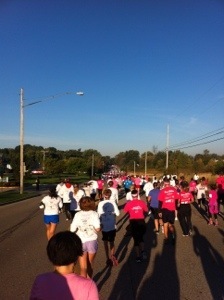 There were over 5,000 people walking or running to promote breast cancer awareness! With such a large crowd, I would never want to run this 5K for speed, but to be honest, I didn’t care about speed that day anyway. What I did care about was doing something that means a great deal to me, as Breast Cancer runs in my family (my mother is a survivor). 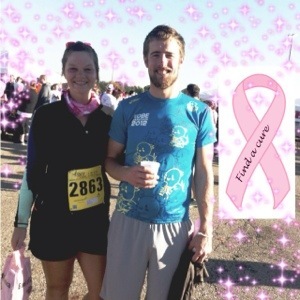 For the past couple of years I did a 10K Pink Ribbon walk in Kobe, and while I wish I could be there this year, too, I was happy that I was able to raise over $200.00 through the Race for the Cure last weekend with generous donations from friends and family. 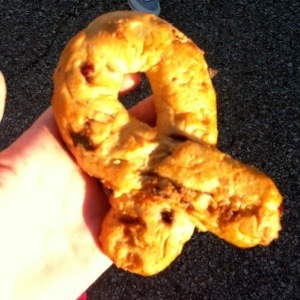 Panera Bread gave out delicious ribbon shaped raisin bread after the run! Chad and I after the run. After the race, we went to my Grandma’s and had lunch with her before heading to the Oktoberfest in Grand Rapids in the late afternoon to meet my brother and sister-in-law. 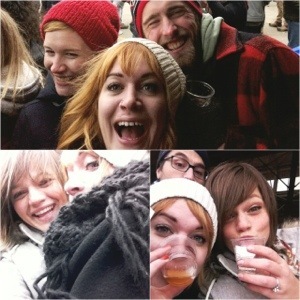 After keg-rolling glory was taken right out of the hands of my husband and brother, we headed downtown for Art Prize. It was pretty crowded, but it was fun to look around. I kept hoping for the exhibits to be like the tents in The Night Circus, but unfortunately that dream was not fulfilled. 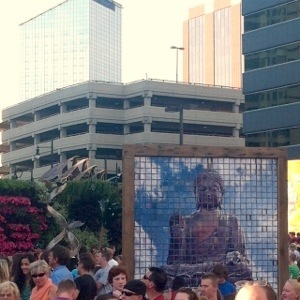 My favorite exhibit out of what we saw that day was this work of Buddha. 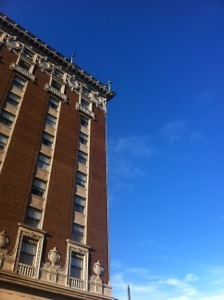 It was a gorgeous day for walking around downtown. 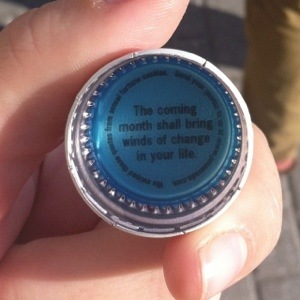 I got a Jones Soda while we were walking around downtown, and the bottle cap said, “The coming month shall bring winds of change in your life.” I can’t give anything away just yet because I don’t want to jinx anything, but I have a feeling the prediction was on to something! Do you foresee any big changes in your life this month? 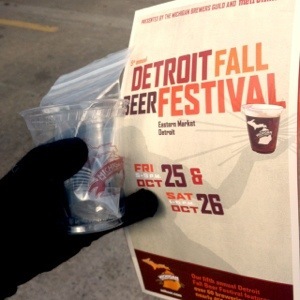 ***My busy Saturday was really fun, and allowed me to cross three things off my fall bucket list in one day! 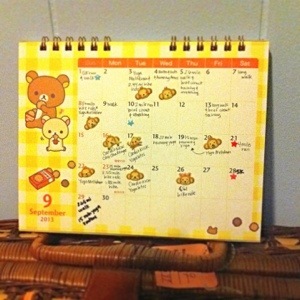 I have two cute Rilakkuma calendars, and have been using one of them to track my fitness each month. I get a star sticker for every run, a bigger sticker (in this month’s case, monkey stickers) for other workouts, and just the satisfaction of jotting down walks and morning yoga/lighter workouts. It makes me feel really good to see a lot of stickers at the end of the month, silly as that may seem! I was thinking of using my other calendar to plan bucket list activities to make sure I remember to get them all in, but I haven’t decided just yet! Do you like to use calendars to track progress? What kinds of things are you looking forward to in October?